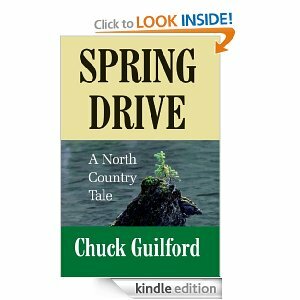 BOOK REVIEW FOR SPRING DRIVE: A NORTH COUNTRY TALE BY CHUCK GUILFORD; 141 PAGES, WORDCURRENT PRESS, 2011. This tale has a Wild West appeal harking back to a time when law and order did not prevail. It takes place in the far reaches of northern Michigan--in a rugged and remote logging community. It is easy to find yourself transported back into time while reading this book. Each chapter is told from the point of view of one of a handful of the main characters which helps to give the story a multi-dimensional feel. The dark side of man's nature rears its ugly head in this story in more ways than one. Not only does it highlight mankind's raw and violent emotions; but also his proclivity to destroy the natural environment around him and blight the Earth wherever he goes. Purportedly based loosely on a true incident, this is an engaging and worthwhile read.